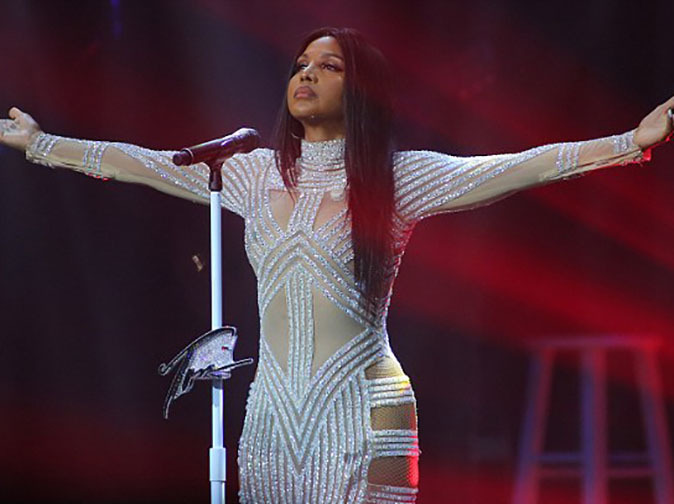 Toni Braxton continued to wear her heart-monitor on stage in Hollywood, Florida on Wednesday after suffering from a second debilitating bout of lupus this month, which caused her to postpone a show in Cleveland. According to TMZ, the star has been advised by doctors to wear her heart monitor round the clock in order to foresee any potential health issues and to keep an eye on any chest pain. While many wouldn't have noticed the monitor at first, it was visible on closer inspection. Proving the show must go on, Toni didn't seem to falter in terms of talent, style and energy as she wowed the crowd with the music that spanned her career. However, things were slightly different in Kansas City earlier this month as the Un-break My Heart singer's health took a downturn, causing her to delay her next concert in Ohio as she checked into a Cleveland medical facility. Following her release from the hospital, the talented vocalist took to her Instagram page to update her fans on the latest in her gruelling health battle. The singer, who's romantically involved with rapper/producer Birdman, told The Huffington Post last year that 'the toughest part' of her battle with lupus was when she had to perform. She said that she's asked herself, 'How did I get through that?' after some of the more challenging outings.